Laila Nehmé, Ph.D. (1994) University of Paris I, is Director of Research at the CNRS since 2014. She received a knighthood in the Ordre National du Mérite, in 2010. She works on the development of Nabataean writing in Arabic scripture, and is compiling a corpus of Nabatéo-Arabic Texts (4th-5th centuries) on which she carries out paleographic and linguistics analyses. Ahmad Al-Jallad, Ph.D. (2012) Harvard University, is an Assistant Professor at Leiden University. He has published on the comparative grammar of the Semitic languages, the history of Arabic, and on the epigraphy of Ancient North Arabia, including An Outline of the Grammar of the Safaitic Inscriptions (Brill, 2015). Michael C.A. Macdonald is one of the great names of Arabian Studies. He pioneered the field of Ancient North Arabian and made invaluable contributions to the history of Arabia and the nomads of the Near East, their languages, and their scripts. This volume gathers thirty-two innovative contributions from leading scholars in the field to honor the career of Michael C.A. 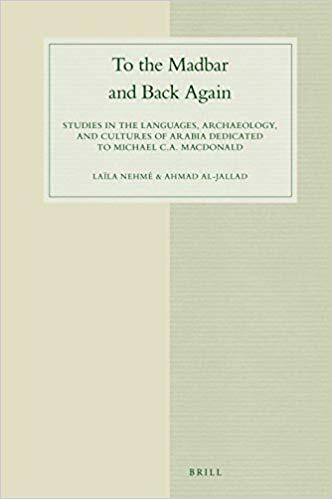 Macdonald, covering the languages and scripts of ancient Arabia, their history and archaeology, the Hellenistic Near East, and the modern dialects and languages of Arabia. The book is an essential part of the library of any who study the Near East, its languages and its cultures. Goras, sanglier ou jeune lion (ou onagre)  ? Are Libyco-Berber Horizontal ṯ and Vertical h the Same Sign ? Mourning for the Dead and the Beginning of Idolatry in the Kitāb al-Aṣnām and the Spelunca Thesaurorum—an Unknown Parallel to Sūrat at-Takāṯur (Q102) ?